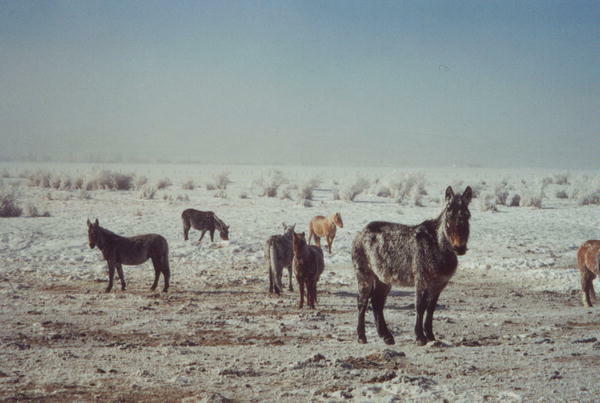 Some are obvious, others were named "after the fact"
I am not quite sure what got me thinking on this subject, but it always puts a smile on my face when I reminisce about why people name horses or mules the way they do. My son and I have been coming up with a few names to choose from because our one and only mare is going to have a baby this spring and we just thought we ought to have some ideas before the fact. 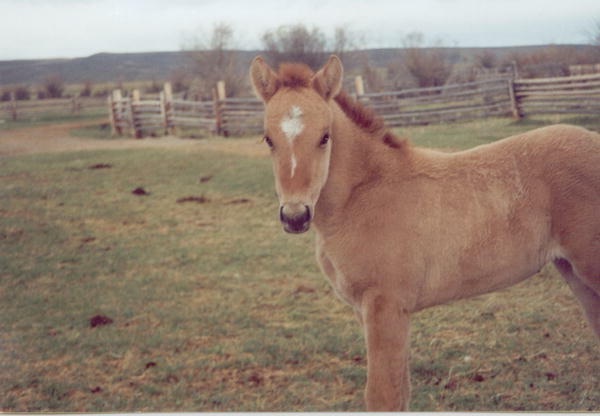 Since it is going to be a mule colt, and the name must start with an M, our latest and greatest is "Murry" for a boy and "Marie" if it is a girl. Now I realize they can, and certainly may change after the critter is around for a while, but it is still fun to think about. I know Clancy really enjoys coming up with these names and, like most kids, he really has a knack for it. He named the mule that we bought for him this summer "Flappy". I am assuming it is because his big old ears just flap back and forth when he walks. He named the mare that I mentioned earlier who is expecting, "KK". That was in his younger years, and I have to give him credit for keeping it simple. 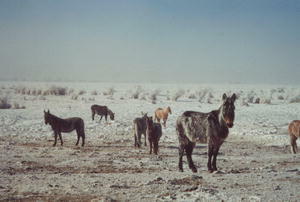 Now there are several faces around the ranch and the next ones that come to mind are "Mart" and "Mort" who are a very well matched team of mules. I cannot take credit for such great names since they were named long before they arrived here, but the only way that you can tell the two Big Blondes apart is that one is a little bit bigger than the other. Hence we have come up with "Little Fart Mart" and "Big Snort Mort". 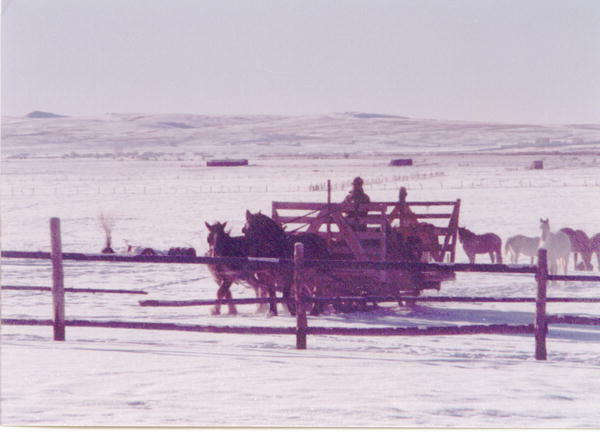 In my younger years I can remember feeding with a team and sled at our ranch in Cora. 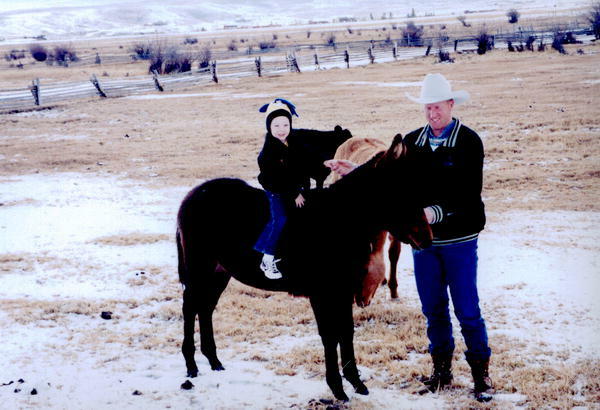 Our very first set of Draft horses were named "Dan" and "Duke". I will always have fond memories of the two, especially the ones of us running full blast through the field scattering bales everywhere after a sonic Boom. Dan was never the instigator and was therefore called "Dan the Man" but his teammate was surely a little more flighty and known more thoroughly as "Duke the Spook". Other four legged critters that bring a grin to my face are "Zeak the Streak" who could not run any faster than a turtle, "Big Enough" who was definitely Big Enough to pack anything you needed, and "Grande Le Pu" who tended to relieve himself of gas quite often (if you cannot read Spanish his name can be interpreted as "the big stinker"). All these are fun names that I can remember, and as I think of all the animals I have been around there were always those good honorable names like: Scout, Sioux, Chief, and Benjamin. 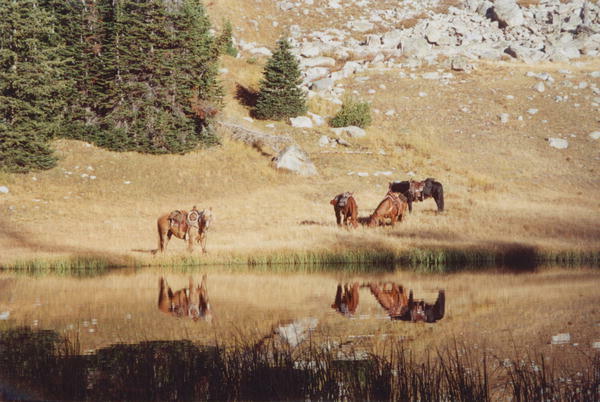 Then there were the names that were obvious like: Croppy (who was missing the tops of his ear) Roany (a fine looking stallion), and Baldy (the big stout sorrel with a completely white face). 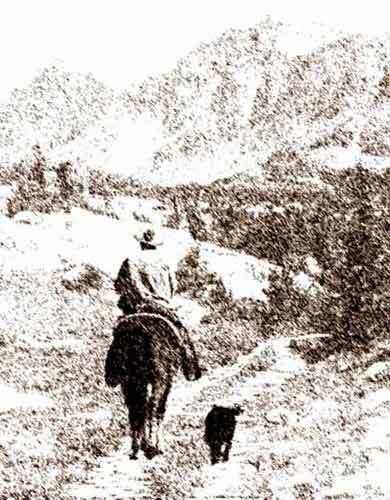 Then there were the one that were named after the fact: Elmer (short for Elmer's Glue), Alpo (who was not around long enough to get a better name) and Buck (who was not named this for being a Buckskin). In fact, I can remember when there where two of them, "Big Buck" and "Little Buck". I preferred the latter most of the time since I was never much of a bronc rider, but did enjoy the smaller thrill on occasion, or at least the opportunity to try and impress someone. Others that have surrounded me and who were not real trustworthy were Skeeter, Spook, Goose, and Three Legs (just kidding). But in all seriousness, each one of these animals has left me with more memories than I will ever be able to share. They all have their quirks that we learn to deal with and we learn to love each one of them for it. I can remember old Milky who you might have already guessed was as white as a gallon of 2%. The best mule you could ever ask for but for some reason when it come time to put a bridle on he just would not have anything to do with you messing with his ears. You would have to unbuckle the head stall and put it around them foot long sound gatherers and not over them or you would end up with a fat lip. I still enjoy being around them all and I guess would not be able to spend the time I do in the mountains without them. Being at the point in my life where rodeos are not as much fun as they used to be, I have steered more closely to the names like "Gentle Ben", "Old Pete", and "Friendly Fred". I do hope someday me and my string meet you and your string somewhere OFF THE PAVED ROAD. If we do, will you please leave "Sugarless" at home.